Search this site: Use the box at the top right of this web page to enter keywords to search this site. 4-H offers a wide variety of opportunities for you to discover your world, your community and yourself. YOU make your own choices and set your own goals! 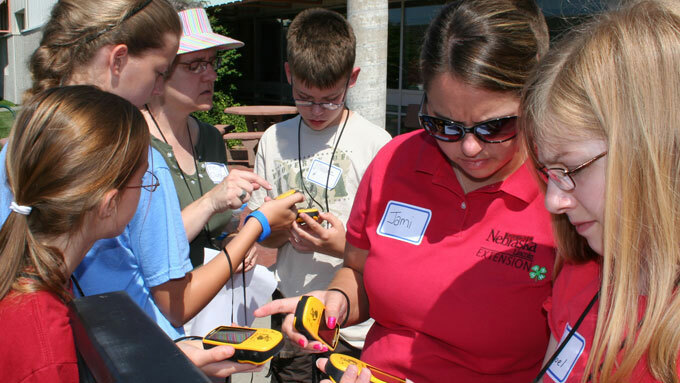 The Nebraska Extension 4-H Youth Development Program is open to all youth ages 5-18. Through learning-by-doing, youth gain practical skills and develop life skills. Currently, there are far more youth wanting to be in 4-H clubs than there are clubs. Families are encouraged to help organize a new club -- which is a lot easier than you may think! Starting a 4-H club now gives plenty of time for members to work on projects for next year's county and state fairs. Clubs range from 5 to 60 members and are led (or co-led) by club leaders -- often club members' parents. Parents are encouraged to attend meetings. Volunteers are the heart of 4-H. Adult leaders partner with youth members to complete projects. Club leaders -- Also known as organizational leaders, club leaders coordinate meeting times and agendas. They also are responsible for club enrollment information. Project leaders -- Clubs may or may not have project leaders who provide leadership for specific projects. Parent volunteers -- Also known as assistant leaders, provide valuable guidance to youth. Club officers -- Youth members choose officers to run their meetings. Nebraska 4-H has more than 150 project areas. Age-appropriate project manuals are written by university experts. Most project manuals have accompanying leader guides. In most clubs, members complete several projects a year. Some 4-H clubs focus on one particular project area, such as rabbits. Many youth exhibit their projects at the county and state fairs. Kristin Geisert manages all non-animal project areas. This includes clothing, food, home environment, engineering and general areas. Cole Meador manages the 4-H livestock project areas and 4-H Embryology school enrichment. Kate Pulec manages the 4-H horse, rabbit and poultry project areas and 4-H school enrichment. Mary Jane Frogge manages the horticulture and conservation project areas. Teri Hlava oversees the 4-H after-school program and assists with 4-H school enrichment. Heather Odoski provides support to all 4-H areas. County and State Fair can provide numerous ideas and inspirations for projects! to Start a 4-H Club. Call 402-441-7180 or complete the Join 4-H! On-line Interest Form! In 2017, Lancaster County 4-H engaged 35,946 youth through clubs, school enrichment and after-school programs. 1,946 adults volunteered. Lancaster County, 4-H is a cooperative effort between University of Nebraska-Lincoln Extension and the Lancaster County government.